Corona introduces many workflow tweaks which will make your life as a digital artist easier. 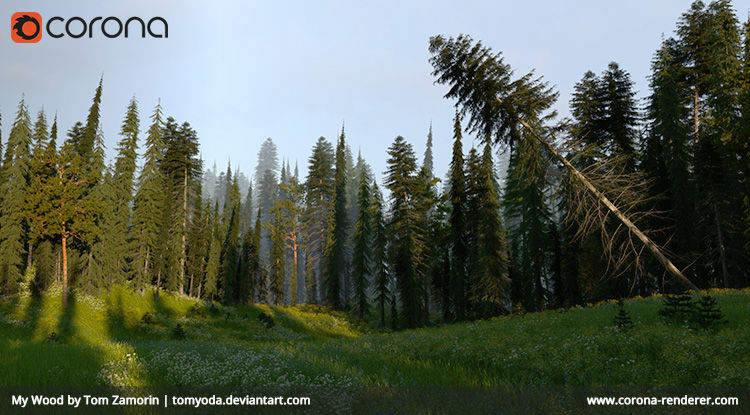 As former CG artists, we know that the output quality and speed are not the only things that make a great renderer. That is why Corona Renderer comes with many powerful tools to accelerate your workflow that will make you faster as well as your renders! Save time (and money) by reducing or even removing the need to use third–party software to carry out post–production work on your renders, thanks to the extensive range of post–processing tools available directly inside the Corona VFB. All of these can be adjusted before, during or after rendering, and settings saved for instant re–use in any scene. 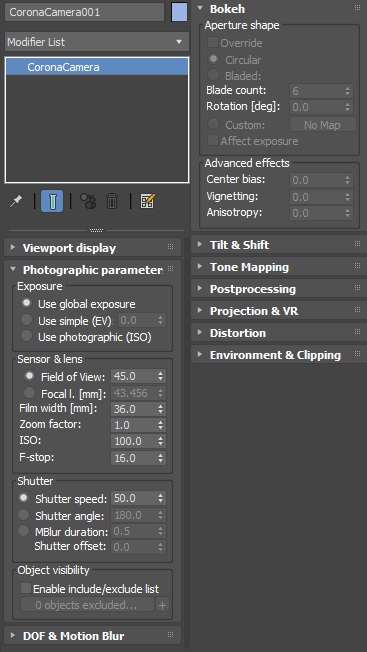 Exposure – Controls the overall exposure of the image. Highlight Compression – Compresses highlights in the image to reduce/remove burned–out areas. White Balance – Controls the white balance of the image. Contrast – Adjust the contrast of the image. Saturation – Controls the overall color saturation. Filmic highlights – Controls a subtle highlight compression without loss of color saturation. Filmic shadows – Controls the richness/saturation of shadows in the image. Vignette intensity – Applies a subtle, realistic vignette. Color tint – Adjust the overall color tint of the image. Curves – Further fine tune the tone mapping, using custom curves with histogram. LUTs – Allows quickly changing the overall look of the image by applying one of many ready–made LUTs. The strength of the LUT effect can be controlled using the LUT Opacity so that it is not “all or nothing”. A variety of LUTs are provided along with Corona. Bloom & Glare – Bloom is a large, soft glow around bright areas in the image, while Glare is a small, sharp glow with adjustable rays around bright areas. The color of these effects can be adjusted using the Color Intensity and Color Shift parameters. Sharpening/Blurring – This first blurs an image and then sharpens it, useful to remove “pixel–perfect” noise and give a more photographic look to the final image. Denoising – If Denoising was enabled, this allows you to blend between the fully Denoised image and the raw render. The Corona Image Editor, commonly referred to as the CIE, is a standalone tool for working with your images. Its user interface is inspired by the Corona VFB, sharing its look and feel, and it offers rich and fast post–processing options for Corona EXRs saved from the VFB such as LightMix, full–featured denoising, tone mapping, LUTs, bloom and glare, curves, blur / sharpen, vignette, etc. 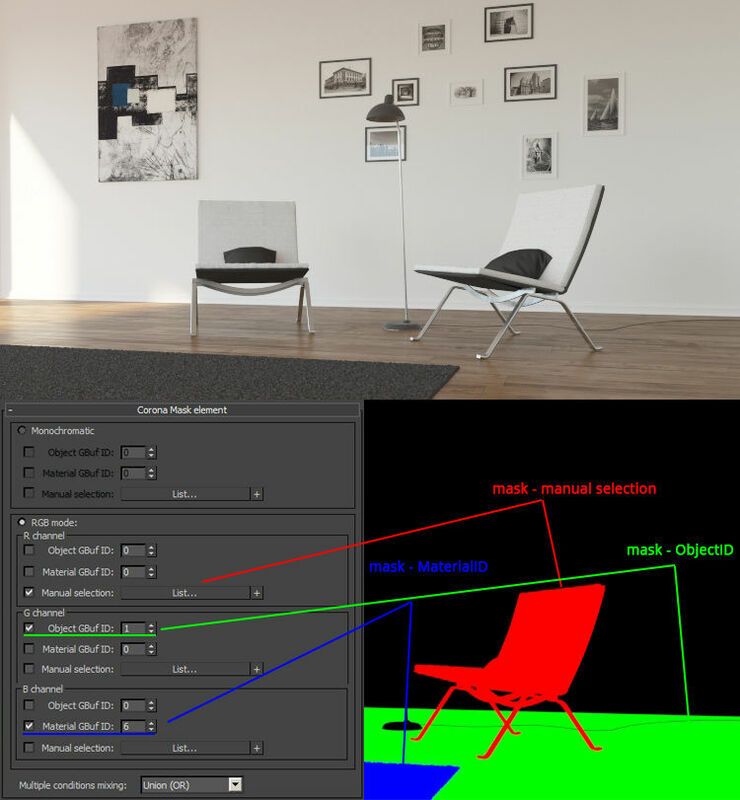 The CIE has lower system requirements than working with an image inside any 3D software – it is not necessary to have a scene loaded while you are working with your images, so you can denoise Corona renders outside of the rendering process for example, reducing the memory requirements significantly. 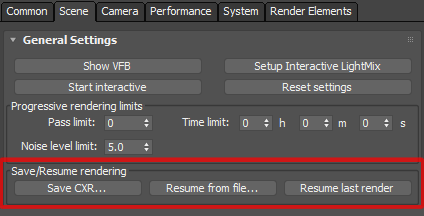 All LightMix and post–processing settings can be easily shared between the VFB from any host application (such as 3ds Max and Cinema 4D) and the CIE.
No need to copy settings manually: CXRs from the VFB are automatically loaded with their associated settings. It also works with regular, non–Corona EXRs (in Float format). It is possible to add bloom and glare to them, apply your tone mapping settings or a LUT, etc. Denoising and LightMix are not available for such EXRs because they miss the necessary “hidden” auxiliary data. It is a portable application, which works with just unpacking, no installation necessary. Free with a regular Corona license. 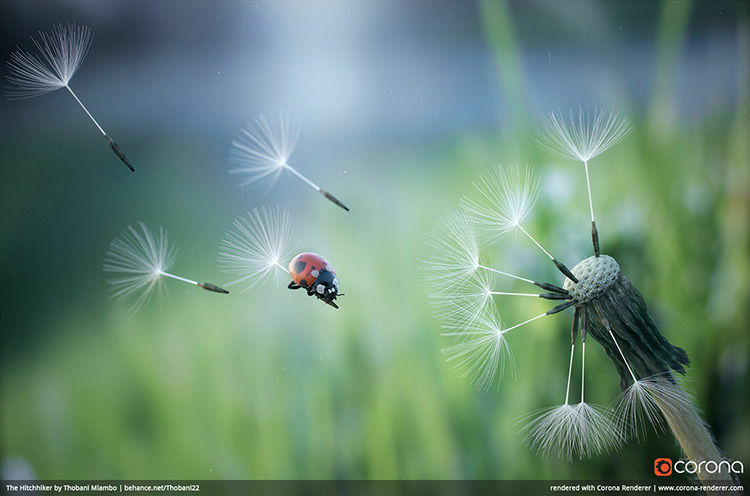 Artists can use a realistic camera model which incorporates all the common parameters, such as f–stop, shutter speed, ISO, sensor width, advanced Bokeh effects, and aperture shape (blades/custom). This allows close matching to live footage. On top of that, you then get access to all the Corona Renderer post–processing options, panorama / VR options, the ability to set focus distance via a static or animated object in the scene, and more. For older scenes, we have maintained the legacy CoronaCameraMod modifier, to ensure any existing scenes will still work as expected. Corona Renderer comes with its own scatter system. Corona Scatter is designed to give a complete solution for distributing millions of high–poly meshes or proxies across geometry surfaces. A typical use is the distribution of vegetation such as grass, forests, etc. Thanks to Corona Scatter you can create scenes with a virtually unlimited number of objects or polygons, while enjoying the luxury of a low memory footprint and high performance. It contains advanced functions like distributing and scaling objects by a texture map, distributing objects along splines, collision detection, etc. The Unified Lister currently lists all Corona Lights and Corona Scatters in the scene, letting you access them and their parameters from one convenient panel. The Unified Lister will be expanded in the next release of Corona Renderer to be the one–stop location for working with all Corona items such as Corona Cameras and Corona Proxies too. Corona comes with its own proxy format, .cgeo. The format is cross platform (you will be able to use it in 3ds Max, Cinema 4D, Corona Renderer standalone, or any other future platform). It uses compression, so it is small and fast to save, load, and to upload to renderfarms. Proxy models are always converted to millimeters and properly scaled when loading into scenes that use different units. The proxy contains human–readable metadata at the beginning of each file, for example the name of the source object and its material, making them friendly to your pipeline. Ever started a render, then minimized 3ds Max to get at something else on your desktop, only to find you can’t maximize Max again until the render is done? Ever started a render then wanted to check a setting in a different tab in Max, only to find that Max is locked? Those annoyances become a thing of the past, as rendering in Corona does not block the 3ds Max UI! The UI has tooltips for most parameters, activated automatically when you hover over the controls. There is also an automatically generated online GUI manual you can consult when you do not have 3ds Max opened. Creating masks in Corona Renderer is an easy process. You can create monochromatic as well as RGB masks simply by specifying Object ID, Material ID or by directly picking objects in the scene. You can combine different selections as union or intersection. Waiting through a final rendering just to discover that you forgot to set one mask can be very annoying. Usually you would have to create a copy of the scene, turn off lights and GI or set up material overrides to speed things up, and render again. 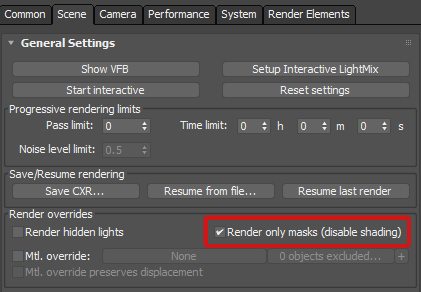 Corona has a better solution: simply set up the missing mask and check the “Render only masks (disable shading)“ option to render only the masks and other render elements without the time–consuming beauty pass. The Corona Material can be made invisible to masks, while staying visible in the beauty pass. This is a very useful function, for example when you want to create masks for objects behind glass panels. At any point during the rendering process, you can save the contents of the frame buffer into a single .CXR file. This includes all the rendering passes as well. You can then open another scene or even close the application, and later resume the original render right where you left of. With one click you can enable the Autosave function, which will save the rendering progress every few minutes in an .exr file. So if your render or computer crashes, you have the latest progress saved. You can either use the .exr as it is if the render had progressed far enough, or resume the rendering from it if needed.